The Kiladeda farm is bustling with life and we are reaping the fruits of our work! Since the new farming teacher joined Amani, the farm has been completely transformed. 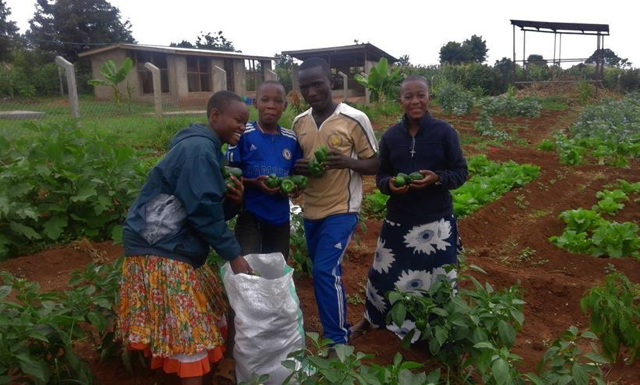 During the past few months, the children worked very hard to prepare the soil, divide the farm in small plots and beds, make a nursery for the new seedlings and fertilize the soil with manure. When the rains finally came the results showed off. The children at Amani are eating more vegetables than ever and twice per week they bring back sacks full of Chinese cabbage, green peppers, eggplants and other vegetables. The chicken project has also been a success and these days all 80 children at the Amani Home eat eggs two times a week. There was some bad news on the animal husbandry side too, however; everyone was disappointed to learn that our cow (Hola Girl) is not pregnant. Not good news for a dairy cow! We would like to send a special thank-you to Friends of Amani Germany, the Porter Family and our Sarasota friends, and everyone who makes this project possible. These are the fruits of your generosity. Thank to you, Amani is becoming better and bigger and helping more children in need. We hope it will make you happy to know how many lives you are helping transform.